The more commonly used cable seals are hexagonal cable seals, which are followed by a long steel wire rope with a hexagonal front and a layer of ABS plastic. When printing text, letters, or numbers on hexagonal plastics, laser printing and hot stamping are commonly used. Generally, laser printing is selected. Its working principle is that the laser generator generates a high-energy continuous laser beam, and the focused laser beam acts on substrate material, the surface material instantly melted, and even gasification, by controlling the laser path in the material surface, so as to form the desired graphic mark. Plastic marking requires the addition of laser powder, while metal marking does not. The first step of the production process is cutting the aluminum, then re-oxidizes the color, then assembles (cylinder, spring, gear), presses the lock cylinder and wire rope, and then prints the label. There are two rope punching holes on the seal body which are used to fix the steel wire rope. The depth of the punching hole is just to block the rope. If the pressure is too large or too small, the wire rope can't hold the wire rope , or causing the wire rope deformation and easy to break. 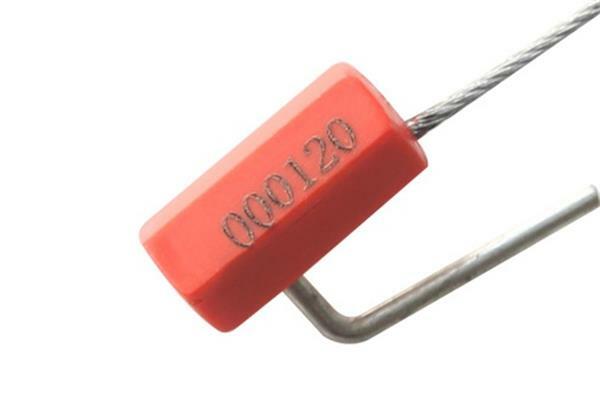 Wire seals are not only used in marine, land, and air transportation, but also widely used in supermarkets, petroleum, containers, railway containers, meter boxes, bank cash bags and other related fields.